What a magical time of year this is. In my beautiful part of England, the cusp of March and April is just the moment when spring is really bursting forth (the vernal equinox traditionally being not the beginning but the midpoint of spring, of course...). The tentative shoots of Candlemas, at the beginning of February, have by Lady Day become fields of spring flowers and branches rich with blossom. So here's a medieval spring poem which is exactly perfect for this time of year. It's from the early fourteenth century (one of the Harley lyrics), so is pretty much contemporary with the poem in my last post - but in praise of a more flesh-and-blood lady! On hire lud to singe. For semlokest of alle thynge. An hendy hap Ich habbe yhent! Ichot from hevene it is me sent. With middel small and well ymake. Longinge is ylent me on. And fairest may in toune. With her voice to sing. For the loveliest of all things. I know from heaven it is to me sent. With waist small and well-made. And dead I will fall down. A happy fate I have yhent! Longing has me come upon. That all her goodness tell can. The fairest maid in town. Whom I have yearned for so long. This is a very lively poem and I don't suppose we're meant to take the speaker's love-longing very seriously, but I've always liked the simile in the last verse, wery so water in wore, 'as weary as water on the seashore' - such a neat comparison between restless waves and the lover lying awake in longing, tossing and turning in bed. 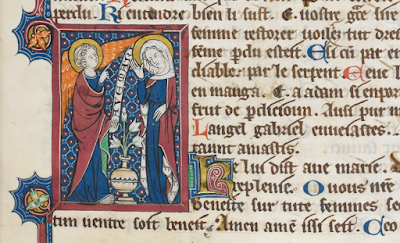 Today is the feast of the Annunciation, or 'Lady Day in Lent', as it was known in the Middle Ages. As I explored last year, the medieval church considered 25 March to be the single most important date in history: it was both the beginning and the end of Christ's life on earth, the date of his conception at the Annunciation and his death on Good Friday. To underline the harmony and purpose which, in the eyes of medieval Christians, shaped the divinely-written narrative of the history of the world, 25 March was also said to be the date of other significant events: the eighth day of Creation, the crossing of the Red Sea, the sacrifice of Isaac, and other days linked with or prefiguring the story of the world's fall and redemption. The date occurs at a conjunction of solar, lunar, and natural cycles: all these events were understood to have happened in the spring, when life returns to the earth, and at the vernal equinox, once the days begin to grow longer than the nights and light triumphs over the power of darkness. The resonances of 25 March reached even unto Middle Earth, as Tolkien aligned the downfall of the Ring to this most auspicious of dates. 'Lady Day in Lent' is the springtime feast of the Virgin Mary, one of several 'lady days' which marked the seasons of the medieval year. 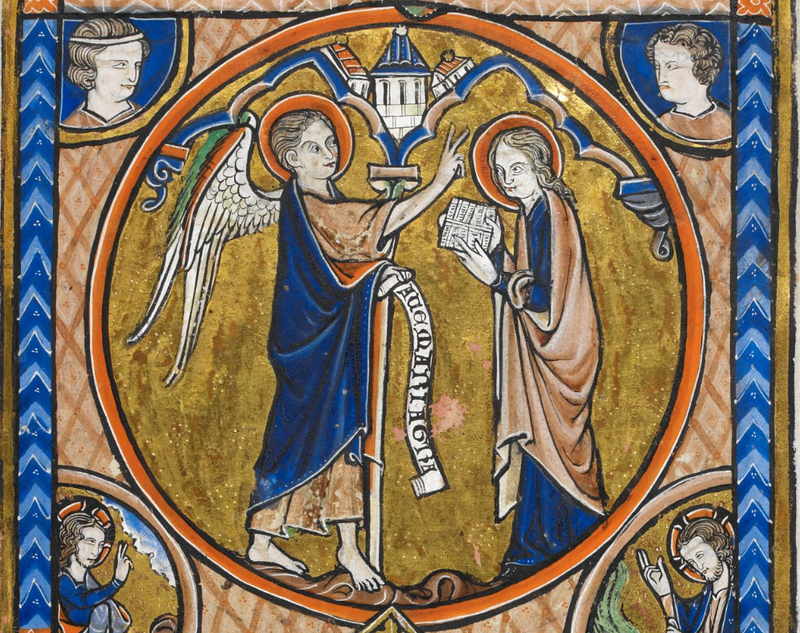 There is a vast amount of medieval poetry and art on the theme of the Annunciation, more than you could read or look at in a lifetime, and much of it is exquisite: I've posted some of my own favourites under this tag. Over and over again, through many centuries, thousands of poets and artists have tried to imagine this scene, where heaven and earth meet and the fate of the universe hangs upon a young woman's word. Into whuch lond, to what wymman, and yn whuch toun alend. Lustneth lythe oure levedy lay that gynth in thisse wyse. That was of grete kunne, of kyng Davides house. He rediliche to wysse ynemned was Marie. Among alle wymmen thou yblessed be." And inwardlyche thouthte whuch was thys gretynge. Thenne sayde thaungel bryht, "Marye, dred thou nouht. Thou havest yvounde grace tovore God ysouht. And oure Loverd hym shal ȝeve hey stoede vor to wone. And hys kyneryche shal boen aylastinge." "Hou may thys ben? vor knoulechyng have ich of no wepmon." And the shal byshadewen the alre hextes myhte. Vor nothyng impossible nys to God that al may welde." "Lo me her alredy my Lordes hondmayde. To me be do, vollyche also, ase thou rather saydest." To hevene he make ous stye at oure endeday. Amen. Into which land, to what woman, and to which town he came. Listen with pleasure to Our Lady's lay, which begins in this manner. Who was of great kin, of king David's house. He knew very truly was named Mary. Among all women thou blessed be." And inwardly wondered what was this greeting. Then said the angel bright, "Mary, dread thou not. Thou hast found grace before God. And his kingdom shall be everlasting." "How may this be? for knowledge have I of no man." For nothing impossible is to God who governs all." "Behold me here all ready, my Lord's handmaid. To me be done, fully also, as thou hast said before." To heaven may she make us rise at our end-day. Amen. As often with early medieval English religious poetry, part of the charm of the language lies in the mixture of the strange and the familiar. 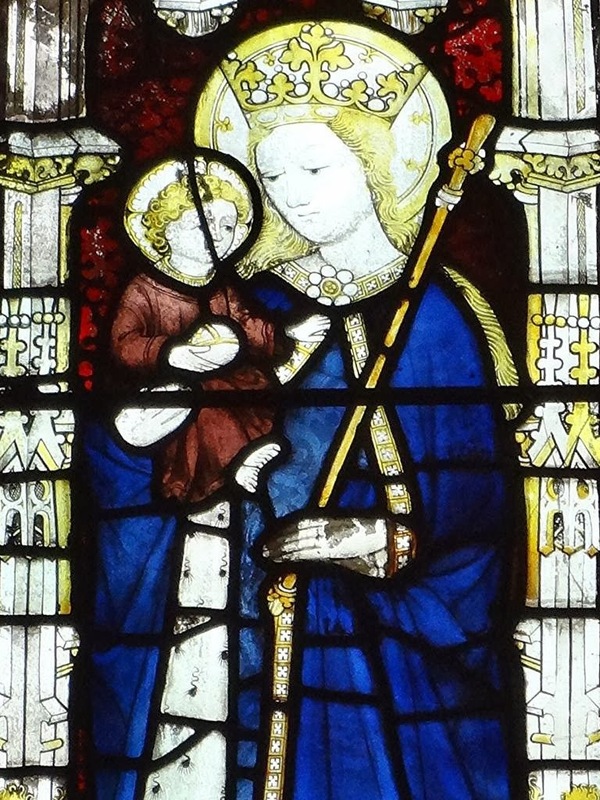 Much of the English vocabulary of devotion to Mary has remained remarkably stable since the Middle Ages (especially considering how forcefully that devotion was suppressed in the post-medieval period). 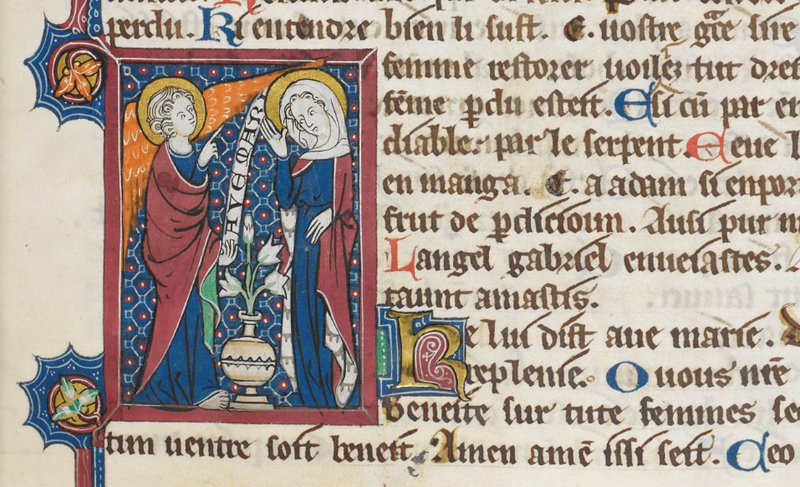 For instance, you can see that the words with which Herebert translates the angel's greeting, in the early 14th century, are still deeply familiar to English-speaking Catholics 700 years later: 'Hayle be thou, vol of grace, oure Loverd ys wyth the.' And yet some words which are familiar to us might have seemed a little less so to Herebert's audience; alongside its homely vocabulary this poem also gives us the first recorded example of the word impossible in English, for 'nothyng impossible nys to God'. The song-like quality of this poem made me wonder whether Herebert had heard the popular song on the same subject, 'Angelus ad virginem' - according to Chaucer, at least one 'clerk' of fourteenth-century Oxford was accustomed to sing that song for his own amusement, 'so sweetly that the chamber rang'. But this poem is worlds away from the naughty young clerk of the Miller's Tale, and stays much closer to the Biblical text than the other song does. The only real addition, apart from the introduction and conclusion, is an English translation for the name 'Jesus': 'that in English is healer'. In Old English 'healer' (Hælend), meaning 'saviour', was very commonly used in place of the name Jesus - Ælfric, for instance, does this almost all the time (here's a good example). This occurs in Middle English, too, though less frequently, so Herebert's audience probably would have been well acquainted with this interpretation of the name. Listen with pleasure to Our Lady's lay that begins in this manner. There's some nice play here on pairs of similar-sounding words, heavy with alliteration - Luke and leche (i.e. 'physician', since St Luke was traditionally said to be a doctor); priest and apryse ('price', renown); lady and lay (a little Dylan-esque, that); and lustneth ('listen') and lythe, which means something like 'gladly, with delight'. That last word suggests, I think, that the whole experience of listening to this poem is simply meant to be pleasurable. It's not really trying to do anything clever with this well-known story, but purely intending to make it pleasant, pretty, 'lovesome' to hear - food for glad and loving meditation. And very lovely it is. In early 14th-century Oxford, surrounded by some of the foremost theologians of medieval Europe, a Franciscan friar named William Herebert was writing a precious little collection of poems. Herebert’s name is not well known today, but his poems, beautiful and distinctive in their own right, also represent an important milestone for English Catholicism: he was one of the first people to turn the Latin hymns of the Church into English poetry. Read the rest here. I've posted a number of William Herebert's poems on this blog before, and they can be found under this tag - I particularly recommend 'The kynges baneres beth forth ylad', 'Wele, herying and worshipe', and 'Hail, Lady, sea-star bright'. As I was writing this piece it occurred to me that 2017 happens to be the closest we can get to an anniversary for Herebert: we don't know his exact dates of birth or death (c.1270 to c.1333 is the usual guess), but we do know that he became master of the Franciscan house in Oxford around 1317. This 700-year anniversary seems as good a date to mark as any - and as regular readers will know, I enjoy a good anniversary. So I've decided that over the course of this year I'll post the rest of Herebert's poems here, with translations, and maybe a few audio recordings too - like many Middle English poets, his verses are often better heard than read on the page. A few of Herebert's poems can be found in anthologies of Middle English verse, and there's one edition of his English poems which is available online, but that edition (while very useful) contains no translations or glossing to help the reader unfamiliar with Herebert's rather tricky dialect. I'll do my best to make his poems more accessible, and to highlight some of the qualities which make them so appealing. To get us started, here's one of Herebert's longer poems, one of the few which has no known source. Well aughte for to spede. My robe he haveth opon. The enke orn of his wounde. That boughte us with his blode. To thee ich make apel. And spek for me thou one. That my robe haveth opon. With wrenches ne with crok. [Who didst] thine own father bear! My robe he hath upon. He is to me bound. The ink ran from his wounds. Who bought us with his blood. Dame, help at the need. To thee I make appeal. And speak for me, thou alone. That my robe hath upon. This is a fairly simple poem - deliberately simple, I think, perhaps because it's not a translation of a hymn. It aims to be direct, intimate and devotional, a private and meditative kind of prayer, and so it depends for its effect on repetition and more straightforward diction than Herebert tends to use in his hymn translations. This seems appropriate for a poem which so tenderly explores intimate family relationships, leaning on the kinship created when Mary gave her son 'my robe', the clothing of human flesh. Christ is our brother, he wears our clothes, and so how can he not be 'bound' by the bond of love? The images here are ones traditional in medieval spirituality, including that striking idea that Christ wrote the 'charter' of human liberation with the ink of his own blood. His sufferings are called to be 'witnesses' to the transaction written upon his body. This is a legal image (fitting for a poem where Christ is not only a brother but domesman, 'judge'), but it's also part of a wider tradition of images drawn from books and book-making, common in medieval devotional writing; these speak, for instance, of Christ writing upon the book of the heart, or compare his body stretched upon the cross to stretched-out parchment on which a message of love is written. It's an image drawn from a literate, documentary, book-filled culture, perhaps inspired by the very ink which flowed from the poet's hands as he wrote these words in his manuscript. It's a metaphor which would have resonated in early fourteenth-century Oxford. 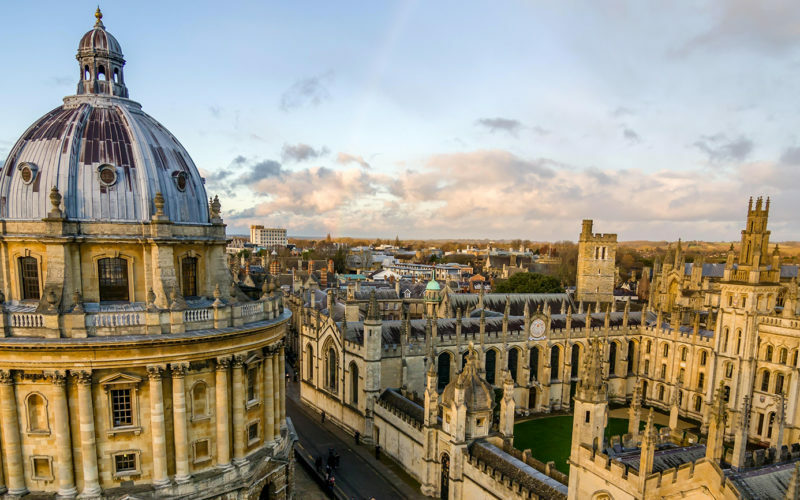 This picture, which the Catholic Herald chose to illustrate my piece, is very appropriate for Herebert, though none of the buildings visible here had been built when he lived in Oxford. This is the view from the tower of St Mary's church in the centre of the city, looking over what's now called Radcliffe Square. 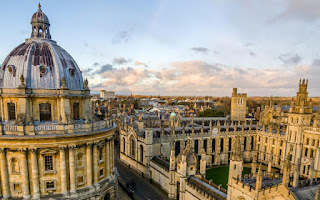 In Herebert's day, looking out from St Mary's, you would have seen not the elegant towers and spacious quadrangles of All Souls' but a cluster of small, closely-packed residential halls populated by students and teachers, the forerunners of Oxford's colleges. This street was the centre of the book trade in medieval Oxford, where you would have found the scribes, parchment-makers, bookbinders and copyists, all the people making the books and writing implements which the university relied on. Various places might claim to be the heart of the University of Oxford, but St Mary's has a particularly good right to that title: it was in this church that the first university library was established (around 1320, during Herebert's time in Oxford, and more than 150 years before the founding of the Bodleian) and in the early days of the university lectures, ceremonies, and graduations took place here. We know that Herebert preached at St Mary's on at least one occasion, since his manuscript of his works contains a sermon to be given there on 9 June 1314, the translation feast of St Edmund of Abingdon. 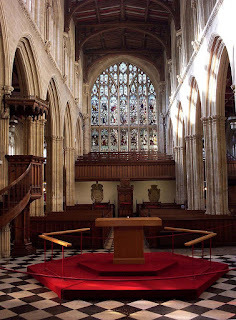 St Edmund, scholar and Archbishop of Canterbury, grew up in Oxford about a century before Herebert was born, and had a strong connection to St Mary's. 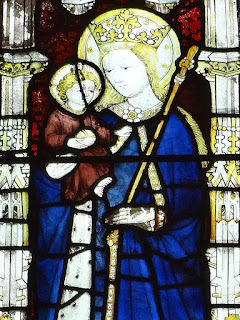 As a boy St Edmund was educated in a school attached to the church, where he had three miraculous experiences during his childhood (read about them here). On one occasion, a ghostly voice prevented him from running out of the church to play with other boys during Mass. Another time, a stone fell off the church tower while he was listening to a lecture in the churchyard, but Edmund was saved from harm. 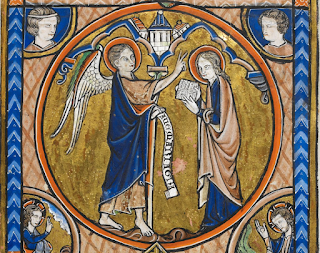 At twelve years old, Edmund made a vow of chastity which he confirmed by a mystical marriage with the Virgin Mary: he placed a ring on the finger of a statue of the Virgin in St Mary's, from which he then found it could not be removed, and wore another ring himself as a token of his vow. 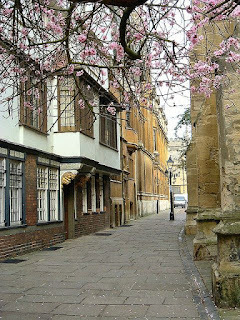 These stories associate Oxford's local saint with the physical spaces inside and outside this church, which you can still walk through today even if most of the buildings around them have changed. 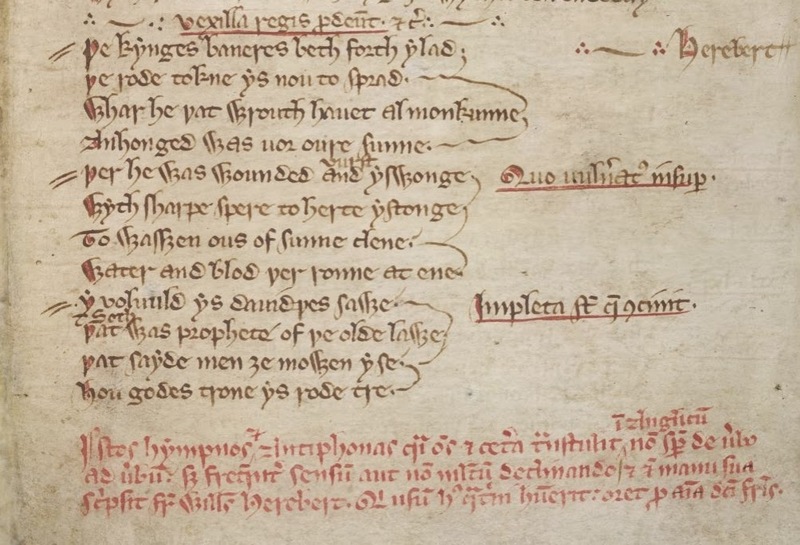 We don't know who wrote this (it's just possible it was St Edmund himself) but it dates to the early thirteenth century, and is a reminder that Herebert, though an innovator in some ways, was following in a very well-established tradition of devotional English poetry. Herebert's poems to the Virgin, including 'Thou wommon boute fere', are very much in that tradition. I emphasise the Englishness of Herebert's verse in part because there's been a little flurry of writing about 'Englishness' lately. In the rather frantic journalistic search for historical analogies for Brexit, Norman Conquest parallels are all very last year - it's all about the Reformation now. Witness this, and this, and this, all of which depend on the idea that 'English identity' is absolutely and inextricably Protestant, constituted in large part by opposition to the medieval, Catholic, pre-Reformation past. This is hardly a new argument (far from it!) but it's a pretty awful one for all kinds of reasons. Quite apart from the dangers inherent in declaring any particular minority religion or denomination to be not English, it involves repeating popular myths about medieval England and its relationship to the rest of Catholic Europe which most historians stopped even bothering to refute decades ago, so simplistic and caricatured are they. Imagine thinking that for the nine hundred years (!) between the Synod of Whitby and the Reformation, England was 'subservient to Rome' and tied to the 'conformist Continent', only capable of innovation, liberty and creativity once free of those wicked foreigners and their Catholic shackles. It's such an ignorant and old-fashioned view - and a very limited and (ironically) constricting way of talking about how other people might understand their own overlapping ethnic, national and religious identities. So now seems a good time to celebrate someone like Herebert and his very English Catholicism - his very Catholic Englishness - which was perfectly compatible for him with both scholarly Latin learning and fluency in French and Anglo-Norman literature. His manuscript is trilingual, representing a very catholic (with a small c) range of interests, and revealing the thoughtful creativity of his poetry and the sensitivity of his pastoral care. These make him appealing, but not at all unique; he was a man of his time. He was a product of the lively and dynamic culture of medieval England and Catholic Europe, which educated and nurtured Herebert and many more like him - and which deserves to be taken seriously in its own right, and not just as a prop in a lazy rhetorical argument.